Crochet to the right! I’ve been a busy little stitcher! And finally, a collection of projects has been completed, so now I can share photos of the crocheting that has kept me sane in between the madness of editing. Go ahead and click any of the images for a larger view! 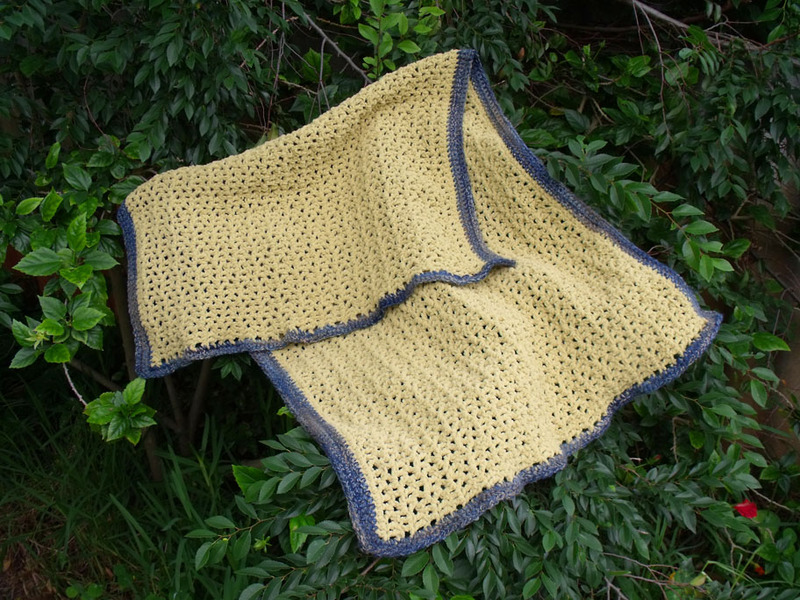 First, is a really super snuggly knee rug or baby blanket. The green yarn is very soft, bulky and fuzzy. This was made with a v-stitch, then just single crochet for the border in a lovely variegated blue yarn. 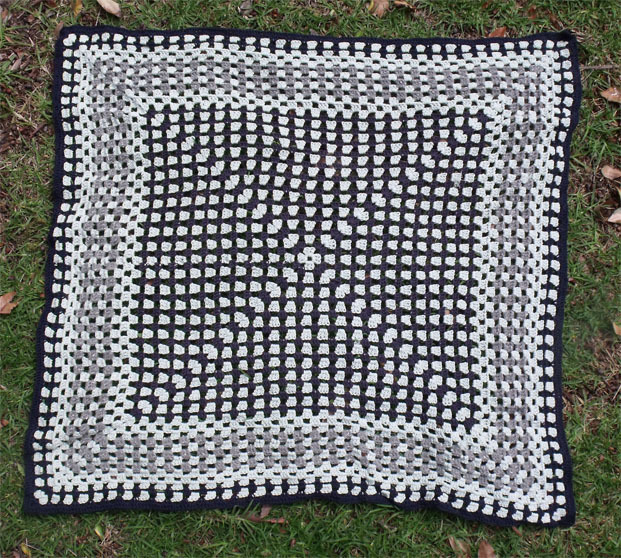 The next knee rug or baby blanket is made from pale and dark blue bamboo/cotton blended yarn, with a segment of grey yarn for contrast. It is SO soft and has a really nice weight to it. This is just a standard granny square pattern, repeated until I was out of the bamboo yarn. Carrot baby set! 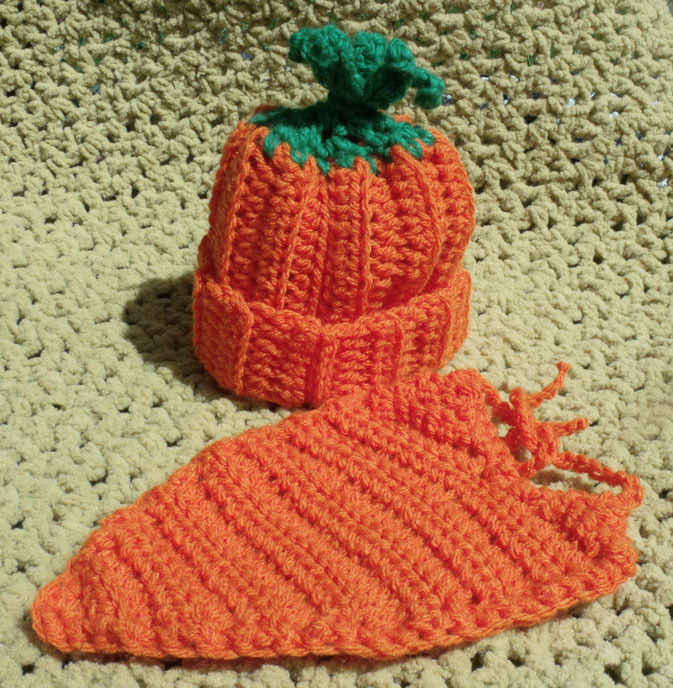 This baby beanie was requested by a friend, made with cute little curly carrot leaves. I whipped up the little carroty shaped bib to go with it, because the idea was just too cute! 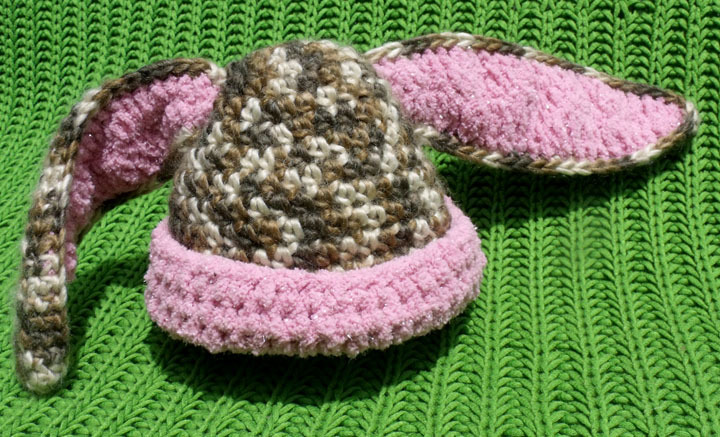 And lastly, for now, is the most ridiculously adorable thing I’ve ever made: a flopsie-eared bunny beanie. The pink yarn is very soft, with little glittery bits through it. I really love the brown and cream yarn. Honestly, brown is such a great colour for baby things, especially as it goes really well with bright, rainbow colours. With these four pieces finished, I still have a whole pile of other crocheting to get through. Good thing it’s a great activity to keep my hands busy while I’m trying to puzzle through my writing – any time I get a bit stuck at the moment, I just pick up the crochet and work on it until I’ve thought through my problem. Awesome! Oh my goodness, the carrot themed set is SO CUTE! 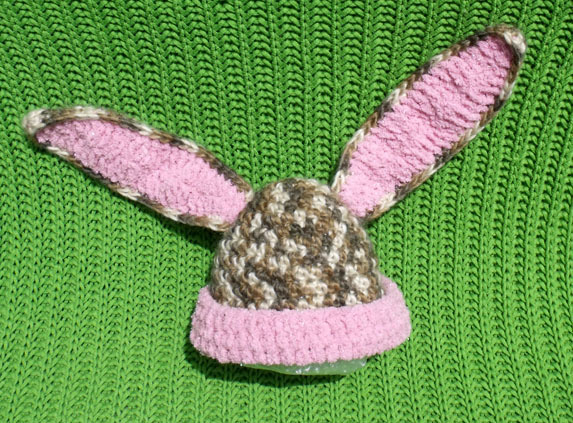 And the bunny hat? OMG! What beautiful projects! Those bunny ears are so squeee!